Besides Joshua McFadden, who cooked on the sixth night, Virgilio Martinez is the only other chef on this year’s Twelve Days of Christmas roster whose restaurant I had never visited. Martinez is chef and owner of Central, a high-end restaurant in Lima, Peru. His colorful cooking, representing both the Peruvian coast, as well as the “high-altitude” ingredients of the Andes, together with dishes presented by hosting chef Christopher Kostow of the Restaurant at Meadowood, were paired with wines by the Mondavi family’s Continuum label. 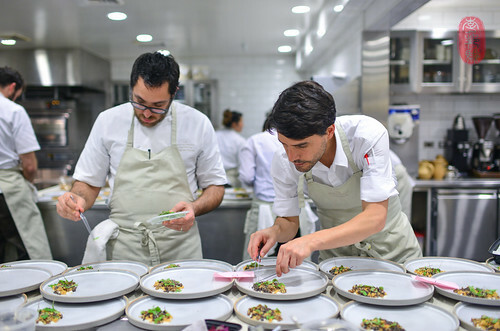 Like Rodolfo Guzman, the Chilean chef of Boragó, who cooked at last year’s Twelve Days of Christmas, Virgilio Martinez introduced some unfamiliar ingredients from South America to the Restaurant at Meadowood. He brought with him a rainbow of grains – variations of quinoa ranging from red to black – and colorful powders made from beets, Peruvian herbs, as well as clay taken from the mountainous shores of Lake Titicaca near the Bolivian border. The grains he cooked separately, and then scattered them over a smooth purée of kohlrabi. To add more color, he painted the dish with beet dust and fresh herbs. The clay dust he passed around the tables in communal bowls for diners to taste – just a pinch. It had a chalky, tannic affect, and tasted to me like green bananas (he reassured us that the soil was safe to eat, telling us that it is used by the indigious Andeans as a remedy for upset stomachs). This grey soil he mimicked in a landscaped dessert that conveyed the contours and colors of the Andes Mountains. There were undulating slices of mangoes tucked between dollops of chocolate ganache, and an avalanche of grey “soil.” Over the top of all of this was a light dusting of bright-green powder made from indigenous herbs. Peru is known for its hundreds of varieties of potatoes. So, Martinez showcased them in a fancy version of a Peruvian dish that reminded me of the Chilean curanto. A stew of potato and meat, or sometimes seafood as in this case (Martinez used clams), it was a hearty and flavorful gathering of humble ingredients. But unlike the curanto, which, is a tumble of root vegetables and meat in brothy stew, Martinez’s version was more of a thick potato mash. 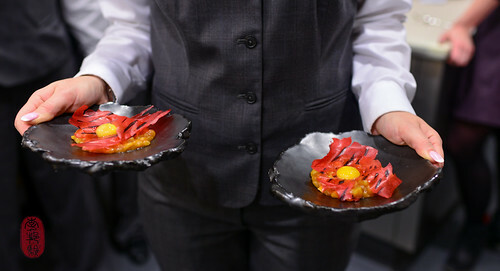 He topped it with a tissue-thin “paper” made from red fruits and a quail egg yolk. Diners were instructed to mix everything together. At this dinner, Christopher Kostow served two of my favorite dishes from this year’s Twelve Days of Christmas. Samp (a rough form of grits) with squid is a dish that I was served at The Restaurant at Meadowood the night before this dinner series started (and one that I was thrilled to have again). The squid was cut up and cooked to such a tender texture that it all but melted into the porridge, leaving a hint of its flavor and aroma. 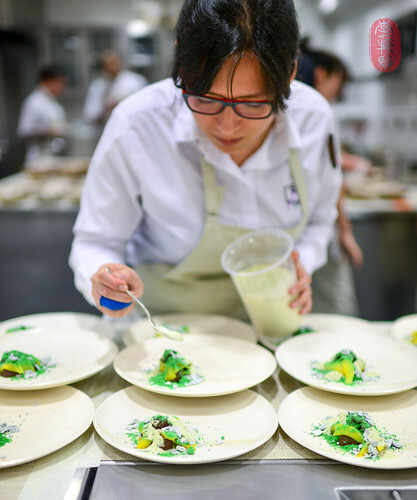 Over the top of the samp were shingled thin slices of matsutake mushrooms, which were garnished with young pine needles. The nuttiness of the samp, the sweetness of the squid, and the woodsy scent of pine made an alluring combination of flavors. Buttery and warm, it was extremely comforting too. He also served a pink fist of veal short rib smothered in a rich suc made of tendon. I’ve noticed that Kostow likes high viscosity — his signature kohlrabi and rye, served in a kudzu-enriched glaze, is a good example — and this dish definitely fell along that spectrum. He used the breezy scent of celery and dill (who knew those two flavors overlapped so well) to lift the heaviness. This was a great dish. I also want to mention the last course that Kostow served at this dinner. It was a transition course from his veal short rib to Martinez’s dessert. And in that role, it was brilliant. Kostow made a creamy pudding out of gjetost (the Norwegian, caramel-like “brunost,” or “brown cheese”) and served it with a fragrant sorbet made from pear lees. But whereas the pear lees offered acid and iciness to help thin the richness of the cheese, a dusting of spice bush – with its more biting scent – really helped to cut through the rest. Salty and sweet, and immensely fragrant too, this was a delicious course. A week after this dinner, Martin Winters, one of the sommeliers at The Restaurant at Meadowood, took me up Pritchard Hill to visit the Continuum Estate — the winery that was featured on this seventh night of the Twelve Days of Christmas. Chiara Mondavi – daughter of Tim Mondavi – was kind enough to host us. She showed us her family’s vineyards and winery, walking us through a brief history of both. She also explained the Continuum label, which she designed. Having studied art, Chiara has a great eye and a wonderful imagination (and a highly expressive personality). 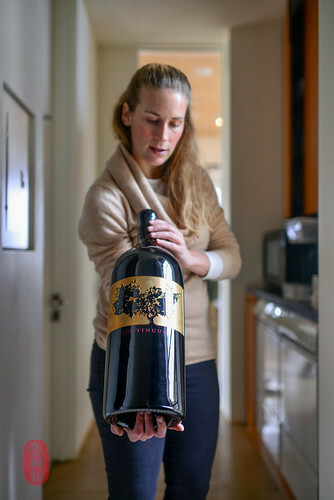 The Continuum label features the silhouette of a Cabernet Franc vine in her family’s vineyard. She traced the silhouette of the vine on a giant canvas that she stretched herself (technically, it’s a triptych, since there are three panels — she added two “wings” to the main canvas after she realized she needed more space). Staking a frame into the ground, she laid the canvas next to the vine in the same spot over the course of a few days, tracing as long as the shadow stayed relatively true to the dimensions of the plant. I marveled at her method, which not only required sunlight (it had been raining two weeks straight when I arrived at Continuum), but also required her to work efficiently, as the sun not only moves quickly through the sky, distorting shadows within seconds, but also moves against the rotation of the earth, shifting the placement of shadows daily. Continuum wines are red wine blends, dominated by Cabernet Sauvignon. They paired beautifully with the heartier courses in the second half of the Martinez-Kostow dinner. The lighter courses at the beginning — the tiradito, samp and matsutake, and kohlrabi and quinoa — were paired with a Sancerre (Domaine LaPorte “LaRochoy”). 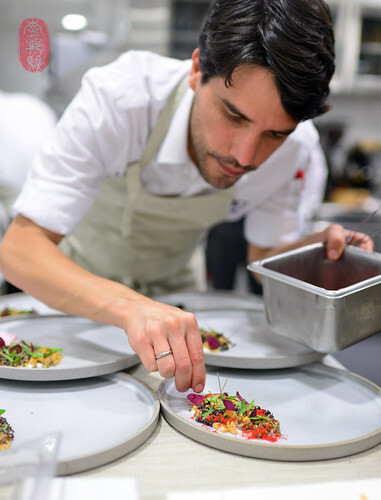 Below, you’ll find the menu from the seventh night of the Twelve Days of Christmas featuring Virgilio Martinez of Central, and wines by Continuum. Following the menu, you’ll find a slideshow of all of the photos that I took. Dry potato, quail egg, and red and black fruits. Tendon suc, dill, celery gnudi. ~ by ulterior epicure on December 26, 2014.